After a frenetic summer conference season, I’ve been looking forward to a slow-down in the big data industry. Not happening! Things are still boiling over and this edition of “Above the Trend Line” exemplifies what’s going on. Let’s start off with some new funding news … AppZen, the Artificial Intelligence (AI) solution for back office automation, announced it has raised $13 million in its Series A financing led by Redpoint Ventures with participation from original seed investor Resolute Ventures. The investment, which brings the company’s total funding to over $17.5 million, will be used to scale the team and business as AppZen focuses on its growing base of enterprise customers. Redpoint Partner Alex Bard will join the AppZen board … MariaDB® Corporation, the company behind the fast growing open source database, announced that it raised $27 million in an investment led by Alibaba Group, with participation from existing investors Intel Capital, California Technology Ventures, Tesi, SmartFin Capital and Open Ocean. Combined with a recent $27 million investment from the European Investment Bank (EIB), this latest capital brings MariaDB’s total funding this year to $54 million. MariaDB will continue its collaboration with Alibaba Cloud, the cloud computing arm of Alibaba Group, to deliver new solutions for the cloud and emerging use cases. MariaDB reaches more than 60 million developers worldwide through its inclusion in every major Linux distribution, as well as a growing presence in the world’s major cloud providers. The latest investments reflect the rising interest in MariaDB from every commercial region around the world … YugaByte, a cloud-native database for mission-critical applications, launched from stealth with $8 million in Series A funding led by Ravi Mhatre of Lightspeed Venture Partners and other prominent angels including Jeff Rothschild, former VP of Infrastructure at Facebook. Bipul Sinha, CEO of Rubrik, is a strategic advisor to the company. The founders, Kannan Muthukkaruppan, Karthik Ranganathan, and Mikhail Bautin, are ex-Facebook engineers who were instrumental in scaling and maturing Apache HBase for massive real-time workloads such as Facebook Messages & Facebook’s Operational Data Store. At YugaByte, they have assembled a stellar team of distributed systems and database experts from Facebook, Oracle, Nutanix & Google and built a fundamentally new database for modern, mission-critical applications. We also learned of a slew of new partnerships, alignments and collaborations … Supercomputer leader Cray Inc. (Nasdaq: CRAY) announced an exclusive strategic alliance with Microsoft Corp. (Nasdaq: MSFT) that gives enterprises the tools to enable a new era of discovery and insight, while broadening the availability of supercomputing to new markets and new customers. Under the partnership agreement, Microsoft and Cray will jointly engage with customers to offer dedicated Cray supercomputing systems in Microsoft Azure data centers to enable customers to run AI, advanced analytics, and modeling and simulation workloads at unprecedented scale, seamlessly connected to the Azure cloud … Kinetica, provider of the fast GPU-accelerated database, announced its partnership with Networld Corporation, the value-add distributor of Kinetica based in Tokyo, to develop a world-class Artificial Intelligence (AI) Center in Japan. The aim of Networld AI Center is to enable customers to view use cases through demonstrations, proof of concept (POC) and training across sectors including telecommunications, e-commerce, manufacturing, Internet-of-Things (IoT) and financial services. Based in Tokyo, the Networld AI Center will accelerate AI and analytics development among organizations and help build Japan’s reputation as a world leader in the AI field. The Center will be supported by Kinetica’s database solution, which is powered by NVIDIA’s graphic-processing units (GPUs) … Attivio, a leading cognitive search and insight platform company, announced that it has partnered with Thomson Reuters (NYSE, TSX: TRI) to integrate its core technology with Thompson Reuters Intelligent Tagging (TRIT). This partnership combines Attivio’s industry-leading text analytics and natural language processing technology with TRIT’s structured taxonomy for financial services. By integrating TRIT into its cognitive search platform, Attivio can now offer its financial services customers better answers to their queries, thanks to a deeper understanding of financial terms and abbreviations. This is especially important as a number of Attivio customers use the solution as a key component of their risk and compliance, equity research, and investment analytics initiatives … Syncsort, a leader in Big Iron to Big Data solutions, announced it has partnered with CA Technologies to empower large enterprises to use Syncsort’s DMX-h Big Data Integration software to access data from CA Datacom and CA IDMS for advanced analytics. This offering provides organizations with a simplified environment for accessing and integrating enterprise data sources. CA Datacom and CA IDMS are high-performance mainframe database management systems used by hundreds of large, global enterprises and government agencies for their reliability and fast processing speeds in handling large amounts of business-critical data. Syncsort DMX-h helps unlock the value of the data by making it accessible for analytics with next-generation analytical tools … GE Aviation’s Digital Solutions (NYSE:GE) and Tableau Software (NYSE: DATA) announced an agreement to empower commercial and military airline customers across the aviation industry with agile visual analytics that can help improve fuel efficiencies, aircraft safety and consumers’ overall flying experience. GE’s Predix platform will provide rich services with detailed data and reports blending airline and industry data that aviation customers can acquire to analyze and customize on-the-fly with Tableau’s advanced visual analytics capabilities … LatentView Analytics announced an agreement today with Arvato Financial Solutions, a leading global financial services provider. The cooperation focuses on delivering services and solutions that help companies drive digital transformation of financial business processes. The agreement will help financial organizations utilize advanced data analytics to gain insights in the market and derive a competitive advantage. The agreement between LatentView Analytics and Arvato Financial Solutions provides international clients both with exceptional consulting services comprising LatentView’s leading techniques in advanced analytics environments with Arvato Financial Solutions’ in-depth experience in financial business processes, industry and domain expertise. 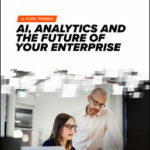 With a focus on clearly defined use cases and a mutual alignment on strategic goals, the partnership guarantees the smooth integration with daily business, continuous change management and regular internal communications for the clients … NVIDIA announced a broad expansion of its Deep Learning Institute (DLI), which is training tens of thousands of students, developers and data scientists with critical skills needed to apply artificial intelligence. DLI – which NVIDIA formed last year to provide hands-on and online training worldwide in AI – is already working with more than 20 partners, including Amazon Web Services, Coursera, Facebook, Hewlett Packard Enterprise, IBM, Microsoft and Udacity. The company is announcing a collaboration with deeplearning.ai, a new venture formed by AI pioneer Andrew Ng with the mission of training AI experts across a wide range of industries. The companies are working on new machine translation training materials as part of Coursera’s Deep Learning Specialization, which will be available later this month. DLI is also teaming with Booz Allen Hamilton to train employees and government personnel, including members of the U.S. Air Force. DLI and Booz Allen Hamilton will provide hands-on training for data scientists to solve challenging problems in healthcare, cybersecurity and defense. To help teach students practical AI techniques to improve their job skills and prepare them to take on difficult computing challenges, the new NVIDIA University Ambassador Program prepares college instructors to teach DLI courses to their students at no cost. NVIDIA is already working with professors at several universities, including Arizona State, Harvard, Hong Kong University of Science and Technology and UCLA. DLI is also bringing free AI training to young people through organizations like AI4ALL, a nonprofit organization that works to increase diversity and inclusion. AI4ALL gives high school students early exposure to AI, mentors and career development. In the new customer wins department, we heard … OVO, a member of Lippo Group Digital, has chosen Kinetica, provider of the fast GPU-accelerated analytics database, and NVIDIA to spur innovation in big data and analytics that fully utilize a 360-degree customer view and derive real-time analytics and insights on shopping trends and the digital lifestyle. Lippo Group is a prominent conglomerate with significant investments in digital technologies, education, financial services, healthcare, hospitality, media, IT, telecommunications, real estate, entertainment and retail. Aggressively investing in big data and analytics technology, OVO is Lippo Group Digital’s concierge platform, integrating mobile payment, loyalty points, and exclusive priority deals. With the support from Kinetica and NVIDIA, Lippo Group Digital will be the first enterprise to integrate an AI, in-memory, GPU database in Indonesia … Trifacta, a leader in data wrangling, announced that New York Life, one of the largest life insurers in the world, has deployed Trifacta Wrangler Enterprise to improve the company’s data usage efficiency. As part of New York Life’s next-generation data platform, Trifacta’s data wrangling software will enable more widespread self-service access and preparation of diverse data while also maintaining centralized data governance and security … MemSQL, provider of the fast real-time data warehouse, announced that Blueshift, one of the fastest growing integrated business planning solution providers globally, has deployed MemSQL for real-time analytics on its ONE Solution. The ONE Solution helps fast moving consumer goods (FMCG) companies merge demand forecasts with profit and loss forecasts for up-to-date information and decision making. ONE Solution is a software tool that facilitates trust across business functions, and when functions trust each other it turns decisions from reactive to proactive. As a result, the tool brings teams together and allows them to focus on one business goal … AlohaCare, a nonprofit health plan serving nearly 70,000 Medicare and Medicaid beneficiaries in Hawaii, and Health Catalyst have teamed up to accelerate AlohaCare’s quality and cost-saving initiatives. The partnership reflects AlohaCare’s strategic response to the increasing prevalence of pay-for-quality initiatives that tie government reimbursement for medical services to the quality of that care. Founded in 1994 by Hawaii’s community health centers, AlohaCare partners with nearly 3,500 physicians and specializes in Medicare and QUEST Integration health insurance, a Medicaid managed care program under the Hawaii Department of Human Services (DHS). As a result, AlohaCare’s revenue comes largely from DHS and the federal Centers for Medicare and Medicaid Services (CMS) and is increasingly based on the quality of care its members receive. AlohaCare will leverage Health Catalyst’s deep experience analyzing healthcare data from hundreds of sources for America’s largest health systems, health plans, and commercial payers to provide quality care to its members and ensure effective use of government funds … DataStax, a leader in data management for cloud applications, and Asset Control announced that DataStax Enterprise (DSE) is powering the development of Asset Control’s new cloud-deployed, NoSQL financial data management platform. Asset Control has deep data management domain expertise and a proven track record of developing solutions that enable complex mastering of data from unlimited sources of market data, reference, and pricing. Asset Control’s new market and reference data platform, powered by DSE, is designed to consume, in real-time, vast amounts of data and empower business users within financial organizations without impacting IT … C3 IoT announced that it has been selected by Defense Innovation Unit Experimental (DIUx) to provide the AI and IoT software platform for rapidly delivering a new AI-based predictive maintenance solution for the U.S. Department of Defense (DoD) to increase asset availability and reduce maintenance expenditures, thereby enhancing operational value and DoD mission effectiveness. DIUx is a DoD organization focused on accelerating adoption of innovative commercial technologies such as AI for national defense. In people movement news we learned … Noodle.ai, a leading Enterprise Artificial Intelligence applications company, announced Deepinder Dhingra has joined as Chief Product Officer. Deepinder comes to Noodle.ai from Mu Sigma where he held positions as Head of Products & Strategy. Before Mu Sigma, Deepinder worked at i2 Technologies, Demantra, and Tibco Spotfire focused on product innovation in supply chain, customer analytics, portfolio performance attribution, risk analysis, and demand planning. Deepinder holds a Masters of Engineering degree from University of Massachusetts, Amherst and a Bachelors in Engineering degree from IIT Kanpur. At Noodle.ai, Deepinder will lead a world-class team of data scientists, data engineers, software engineers, supercomputing technologists, and product managers to extend Noodle.ai’s position as the leader in Enterprise Artificial Intelligence applications. He will join the Noodle.ai Executive Leadership Team … SnapLogic, a leader in self-service application and data integration, announced that it has named Rich Link as vice president of global channel sales and strategic alliances, Carlos Hernandez Saca as sales and partnership area director for Latin America, and Marti Pozzi as global director of strategic accounts. The new strategic hires bring decades of partner development and management experience from global leaders such as Salesforce, Oracle, SAP, Informatica and Cisco. The three are driving channel partnerships and enablement programs as the company continues its global expansion and forges a new era of AI-powered application and data integration … Arcadia Data, provider of the first native visual analytics software for big data, announced the appointment of Randy Lea to its executive management team. In his role as chief revenue officer, Lea will focus on furthering the company’s strong sales momentum as it solves big data analytics challenges for its customers. His leadership will be instrumental to Arcadia Data as it continues to help enterprises deploy self-service business intelligence (BI) and visual analytics by connecting business users to big data. Lea brings unique experience to the Arcadia Data executive team in the form of prior leadership positions across sales and sales support, product marketing and product management, business development, partnerships, and also business and data science consulting at both startups and large companies. As the Sales Vice President at Aster Data, Lea managed the sales and professional services organization for the Aster Analytics platform and helped grow the business by a factor of seven. Lea also led the open source consulting organization for the Americas at Think Big Analytics, where he concentrated on improving business processes and increasing business value for customers facing big data analytics challenges … Neura, a leading Artificial Intelligence (AI) platform for user awareness, announced it has appointed Amit Hammer as chief executive officer. Gilad Meiri, co-founder and previous CEO, will continue to serve as a member of the company’s Board of Directors. Prior to this change, Hammer served as Neura’s chief operating officer, overseeing business and operations. He brings over 20 years of business management and technical experience to the role of CEO. While at Texas Instruments Inc., Hammer led multiple IoT connectivity businesses. In his new role at Neura, Hammer will lead the company in its next phase of accelerated growth.